AvailabilityThis item ships separately from other warehouses. Please contact us for availability.Ground shipping guaranteed 3 days or less for contiguous US! The Roomba Braava 320. Watch the short, robotic cleaner do your sweeping and mopping for you! 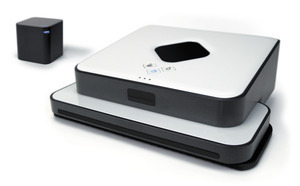 The new iRobot Braava 320 is the next step in floor mopping robots. Designed to systematically cover your entire floor in one pass, cleaning your floors has never been easier. All it takes is a disposable cleaning cloth, placing the Braava 320 on the floor, and pressing either the Mop or Sweep buttons. Just like that! Once the machine has returned to its original position and completed the cycle, simply dispose of the cleaning cloth, or if you've used the included microfiber cloth, wash it for later use. A dry sweeping cycle allows the device to cover up to an 800 square foot area in a single sweep. Furthermore, the machine can clean up to 250 square feet in a single mop to focus on properly cleaning the area while the attached cloth is still wet. Disposable cleaning cloths make clean-up a breeze. Simply attach, then toss out when the device is finished! The Braava 320's NorthStar Navigation System operates much like an indoor GPS. By projecting a signal that it uses to calculate and map out its location within the chosen room, it uses the navigational system to build an ongoing map as it cleans. This allows it to understand and avoid obstacles such as walls, drop-offs, furniture legs, and more as it encounters them, letting it clean more efficiently with each repeated use in a room. The NorthStar Navigation System keeps track of where the Braava 320 has been and where it needs to go, which allows it to thoroughly clean your entire floor without hassle. The iRobot Braava 320. Revolutionize your boring chores with the latest in robotics! Braava has two cleaning modes to choose from depending on the job you need done. 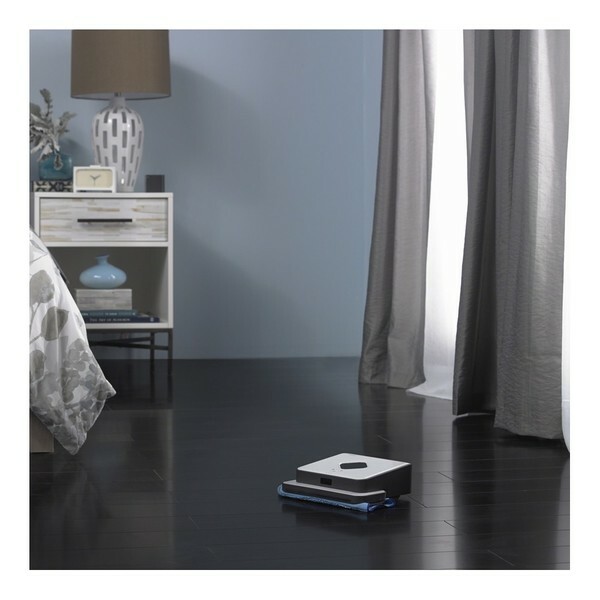 In sweep mode, Braava dry mops your floors moving in straight lines using dry cleaning cloths. In mop mode, Braava uses a special back-and-forth mopping action and damp cleaning cloths to lift surface dirt and grime off your floors. The NorthStar® Navigation System works like an indoor GPS that helps Braava keep track of where it has been and where it needs to go. The NorthStar Navigation Cube projects a signal that Braava uses to determine its location. As Braava cleans, it builds a map of the area, mapping walls, obstacles and drop-offs as it encounters them. Getting your floors clean has never been simpler. Cleaning cloths are easy to attach and remove with the removable magnetic multi-purpose cleaning pad. With the cleaning cloth attached, just press the Sweep button for dry mopping or Mop button for damp mopping. Whisper-Quiet: Cleans your floors for you without disrupting your daily activity or sleep. Pause/Resume: Retains a map of its cleaning space so you can replace the cleaning cloth mid-cycle and it won't miss a spot. Return: When the device is done cleaning, it returns to where it started and powers down automatically. US Warranty 1 year limited warranty on defects in materials and workmanship. The petite design allows for effortless cleaning beneath low furniture and shorter spaces. Cleans all manners of hard surface flooring, from tile, to vinyl and laminate. Works quietly, and turns itself off when finished. The cycle won't disturb your sleep or daily routine.